Be the first to share your favorite memory, photo or story of Nyla. This memorial page is dedicated for family, friends and future generations to celebrate the life of their loved one. 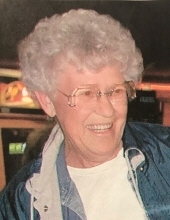 Nyla Marie Knowlton, 87, of Stuart, IA passed away peacefully on Thursday, January 17, 2019, at The New Homestead in Guthrie Center, Iowa. Born September 25, 1931 in Mountain View, Missouri to Otto and Elsie (Early). Eventually, she moved to Milwaukee, Wisconsin and then to the farm near Dale City, Iowa in March 1942. Nyla attended Country School and graduated from Panora High School in 1950. She met Melvin F. Knowlton in July 1948. Nyla and Mel married August 5, 1950 in Altoona, Iowa via Justice of the Peace. They have celebrated over 68 years of marriage. They moved to Des Moines in June 1950 and Nyla worked for Equitable Life of Iowa until 1993. They had a son, Ricky Cecil Knowlton, born approximately at 4:15 p.m. on March 26, 1952. Rick married Carol Sue Norton on January 29, 1972. Mel and Nyla had granddaughter, Vanessa (Knowlton) Phillips on February 4, 1974 followed by a grandson, Steven Roy Knowlton, born on June 10, 1975. As married life continued for Mel and Nyla they were blessed with 3 great-grandsons, Austen Knowlton, Guy Talcott and Jakob Knowlton; and 2 great- granddaughters, Kailey Knowlton and Gracie Phillips. Nyla is preceded in death by her parents, Otto & Elsie (Early) Wenzel; sister, May (Wenzel) Richard; brothers, Ray Wenzel, and Ivan Wenzel. Nyla is survived by husband, Melvin Knowlton; son, Rick (Carol) Knowlton; granddaughter, Vanessa (Ryan) Phillips; grandson, Steven Knowlton; great- grandchildren, Austen Knowlton, Guy Talcott, Jakob Knowlton, Kailey Knowlton and Gracie Phillips. A special thanks to The New Homestead staff and Hospice nurses for their compassion. Per Nyla’s wishes there will be no funeral service. To send flowers or a remembrance gift to the family of Nyla Marie Knowlton, please visit our Tribute Store. "Email Address" would like to share the life celebration of Nyla Marie Knowlton. Click on the "link" to go to share a favorite memory or leave a condolence message for the family.